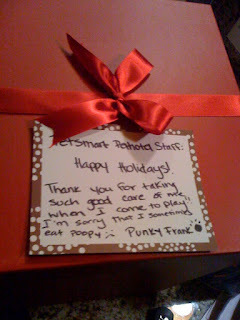 In case you can't read it, it says: "Thank you for taking such good care of me when I come to play. I'm sorry I sometimes eat my poopy." 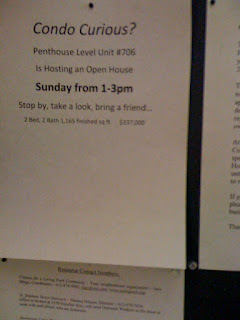 Kara: "It seems there's an open house in unit 706 on Sunday. WE LIVE IN UNIT 706"
surprise open house. It was something we had discussed with our agent a long while ago, but just in mulling over ideas, I didn't realize he had followed through with it. So there it was. We were to spend the rest of our weekend cleaning. Well not really the whole weekend, but ya know, a while. Surprise...you're having an open house! Just think if I hadn't wandered around and looked at the bulletin board. Sunday - we had to flee our house due to the surprise open house. We drove around, wandered. Dog played at Grandma and Grandpa's with Mocha and Teddy. We're going to need to come up with some activities to fill our time when we have to flee our house. Please comment if you have some ideas. 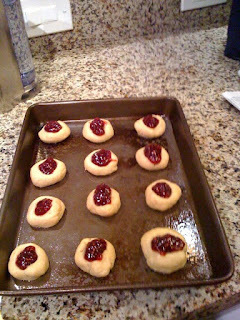 We returned home and in the spirit of Christmas I had to bake Christmas cookies. I just had to do it. It was the spirited thing to do. My office is enjoying them today.